The Rebel Alliance used the U-Wing to deploy troops under the cover of darkness or into the midst of dangerous situations. You can use the Star Wars X Wing Game U-Wing Expansion Pack to transport Jyn Erso and the other heroes of Rogue One: A Star Wars Story straight to your tabletop. 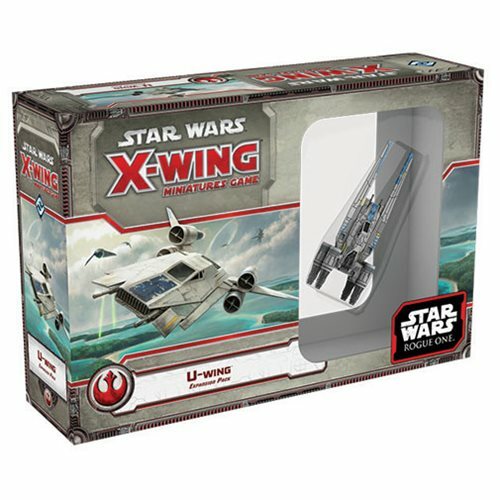 The expansion pack features a highly detailed and pre-painted miniature U-Wing with articulated wings that can pivot back and forth, along with 4 ship cards and 14 upgrades. Conduct espionage. Promote Rebel bravery. Pivot your ship's wings to real effect. The Star Wars X Wing Game U-Wing Expansion Pack makes it all possible!